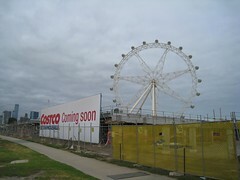 I haven’t been to the Melbourne Costco yet and based on what I’ve read online, I don’t think I ever will. Don’t get me wrong, Costco is a great idea and whenever I am in the US, I try visiting there partly out of curiosity and partly to get a large quantity of US only products to bring home. But for a country with very little buying power, general isolation from the world, and the fairly good prices of local markets and Aldi, I don’t see the savvy shopper saving money. The commute to the city was smooth. The train ride back was fantastic! I was able to find a seat from Melbourne Central station all the way back to Watergardens station during peak hours. But since yesterday, I guess everyone else is back at work. What with the school holidays, shopping for back to school products, tourists, etc, plus the potential heatwave arriving today, the train commute is going to be a nightmare! Fare Evaders! Who’d you call? GHOSTBUSTERS! Here’s a funny one for all those who refuse to take public transport (admit it, you’re one of several millions in Melbourne who’ve swore allegiance to your car). I picked up this ghost buster brochure (right: series 6 of 10 Passenger Card) while travelling through the city last week and was laughing my head off just reading it. In an attempt to ‘revive’ interest in tram transport, Yarra Trams has launched a Did You Know? series of competition where regular all you’ve to do is answer a simple question and a 16GB iPod Touch and a monthly metcard is potentially yours. But who cares about the freebies when the flipside of the brochure just makes your day?! I like how we're talked down like we're stupid. So. Epic. Funny. Check out the Yarra Trams website for more funny brochures and win some awesome prizes here. There’s a bloke who frequents the top of the stairs of the Macarthur street exit of Parliament station every morning. His name is Bryce and he sells the Big Issue. He used to tend the door at the Windsor across the street; and no doubt has plenty of stories to tell. There are plenty of people in the city who also sell the Big Issue and just like Bryce, they have just as many people saying hi, as people walking past them every day without acknowledging their “Hello’s” and “Good afternoon’s”. I feel bad when I don’t have the cash on me to buy a copy or when I’ve already bought the latest issue, but I learned a while ago that it’s OK to stop and chat sometimes – just because. I think a lot of people look down because they can’t buy a copy that day, or because they are in too much of a hurry, or maybe because they’re tight, or don’t like them. Whatever the reason, maybe it’s time you got to know one of these people. You don’t need to invite them home for dinner, but perhaps you could spare a few words now and then. That was the message I got over MSN on Sunday evening. I was out the entire day though, and did notice the rather apparent foggy-ness, so I quickly dismissed my friend with a “been there, seen it” gesture. Until I looked out my window. And realised all I could see… was… wait – I could not actually see anything. On the right was the junction of Swanston Street and Queensberry Street. I swore there are buildings on the sides and somewhere up the front. Posted in Uncategorized | Comments Off on "wtf… fog."